I'm beginning to wonder when the saturation point will be reached in terms of retro thrash bands on the market. There seems to hordes of them right now, swarming our mailboxes and inboxes. The Eviles, Municipal Wastes, Angelus Apatridas and what have you have plenty of competition from even younger bands, that's for sure. And we shouldn't forget that the old bands, the ones who were part of the first or second great waves of thrash metal are also either still here or reforming to perform past glories. To tell you the truth, we receive a lot of material from bands who shouldn't even try. That's the less interesting side of this reviewing thing. 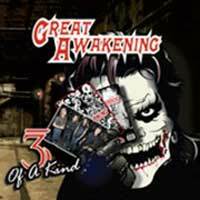 Luckily, there are also bands like Great Awakening. My gut feeling tells me that this is a rough diamond which just needs some shaping to shine. This compilation of three demos would have benefitted from being cut down to only include the sharpest pieces, that much should be admitted, but if you take e.g a song like Swallowed By Hell, you have a full-on thrash metal attack, nothing short of a blast of a song! And the track Misfit follows suit by standing out as a tune with extremely effective riffting. But as I mentioned, there are definitely fillers on this compilation, and the odd Hit n'Run which, to me at least, sounds like pre-Anselmo Pantera. It doesn't really belong here. Just my opinion, alright? Check these young hopefuls out - they've certainly got something.